Since we are now looking for proposals for Network’s spring show in April 2016 (deadline for initial proposals 31st October), we got in touch with the self-proclaimed Wicked Uncle of Network, Andy Kerr, for some insider tips on direction. Useful if you’ve never directed before or even if you have but want to learn from the best! “We are a creative community and new ideas are encouraged. Discussing new plays and ideas is vital for our future. We have become a really big group and, with so many potential actors and crew, not everything has to be a full-scale, huge production. If you have a great idea for a one-act play with a cast of 3, that we can put on for £50, then tell us about it! My advice to any budding directors is to get involved with the production side of a show instead of purely acting. You need to keep your eye on all the balls. For many of our members, their route into the group is the workshops, but although they are wonderful fun and a great way to get involved, directors also need knowledge of how to deal with a production as a whole. Many people have fabulous artistic ideas about a play but no knowledge of the people they need around them or the range of skills required. You should perhaps start with a small cast and a show that is easy to produce. Larger casts can be harder to bond together and you can spend your whole time organising who needs to come to rehearsals and when. If you do have an idea, then please submit your proposal to liverpoolnetworktheatre@gmail.com, including a few sentences about why you think this play would be a good choice and some initial ideas on staging. Both a director and production manager should be included on the proposal. Please also bear in mind that the chosen show will be performed at the Lantern Theatre – backstage space is at a premium here, so maybe your half-scale version of Titanic, The Musical, might be better suited to another venue. All proposals received will be reviewed at the committee’s next meeting in early November. If you need any advice or have any questions, please feel free to get in touch before you submit. If you have any ideas for a smaller show outside of the April window, as suggested by Andy, we will be happy to hear from you. Send us an email and we can discuss your plans. Lastly, for those who cannot do April, the following production will be in July and submissions should be made before the end of the year. More details soon. A very special thank you goes out to former committee members James Gray, Elaine Stewart, Faye Christiansen and Mike Leane for all their hard work in the past year. The new committee successfully held its first meeting in early October. We are highly motivated and full of ideas for the new Network year and are happy to be approached with any questions or suggestions you may have. We are also working on bringing the website up to speed, so stay tuned for more news in the next few days! 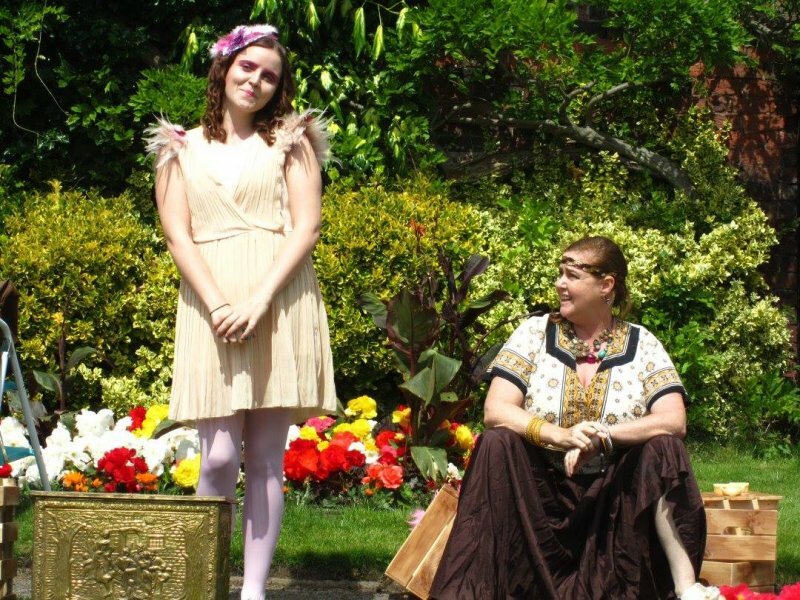 The 2015 Summer Production will be Easy Virtue directed by Lauren Steele. The 2015 Autumn Production will be Hobson’s Choice directed by Mike Sanders. Please keep an eye out for further details and audition dates. 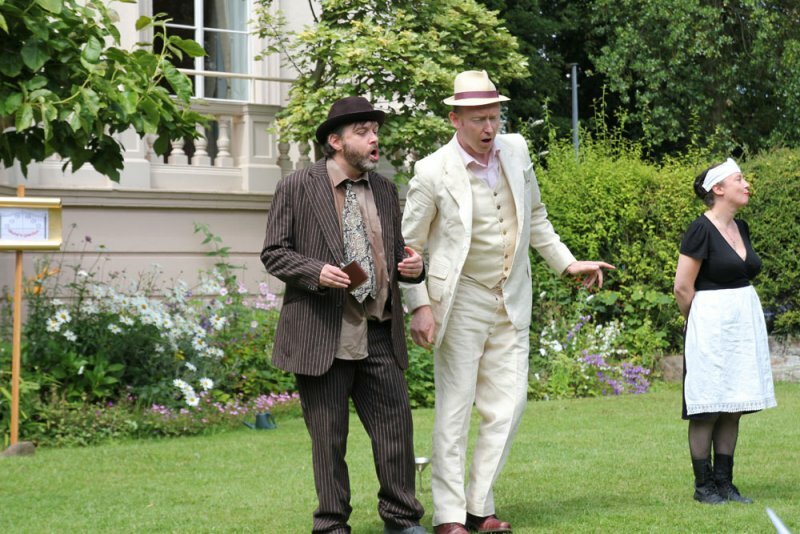 If you’re already missing the summer and Network’s outdoor japes in parks, lovely houses and libraries, why not help us pick our summer play for 2015? What we’re looking for is a comedy that will pull in the crowds and give the cast the chance to sweat it out (or get very wet) in fabulous period costumes. If you have a favourite play by Shakespeare or his contemporaries, right up to Oscar Wilde and just nudging the 20th century, we’d like to know and if you like a play that we’ve already performed, don’t despair; we’re happy to consider repeats if they were a few years ago. Keep in mind, though, that we are helpless thespians and want to wear corsets. And that’s just the men… You’ve got until the Christmas break to come up with ideas so feel free to chat with any of the committee members if you’ve any questions, and we’d love to hear from prospective directors too. Looking forward to hearing your exciting ideas! Next Tuesday’s workshop (5th August) will be a read through of the Dracula script. please note, this is not any form of audition, it’s just to read the script for time and to get a feel for it and for any cuts that may need to be made. You are all most welcome to attend. There will be another fabulous Liverpool Network Theatre quiz on the 5th September at the Pilgrim form 7pm. Ticket prices TBC. Do spread the word, we hope to see you all there. Dracula will no longer be our Halloween play and has been moved to March. Auditions will take place in November (dates TBC). Rehearsals will begin before Christmas. 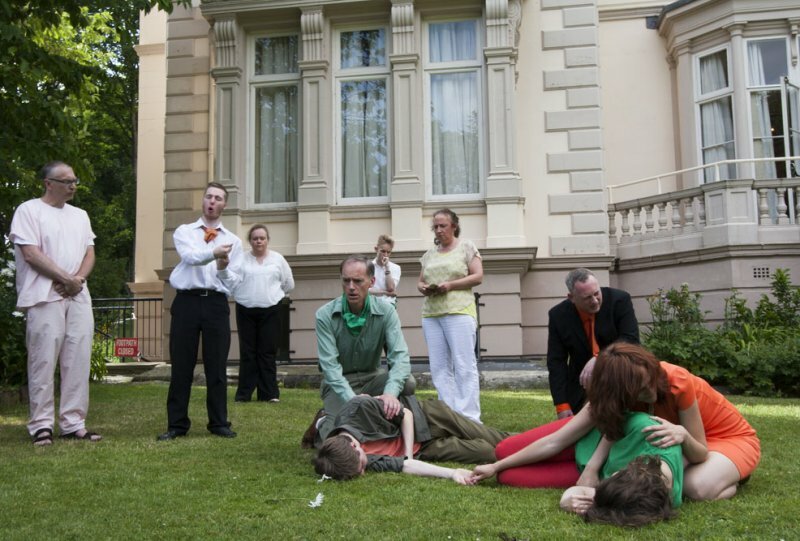 expressions of interest are welcomed for directing, production managing, backstage support etc. We are also seeking thoughts and ideas for the Halloween production, do let us know if you have any particular ideas you would like to share. Tuesday 16th September will be an Open meeting, also including an AGM. All are welcome to attend. This will take place at Hope Street Ltd from 7pm. There will be no workshop that evening. 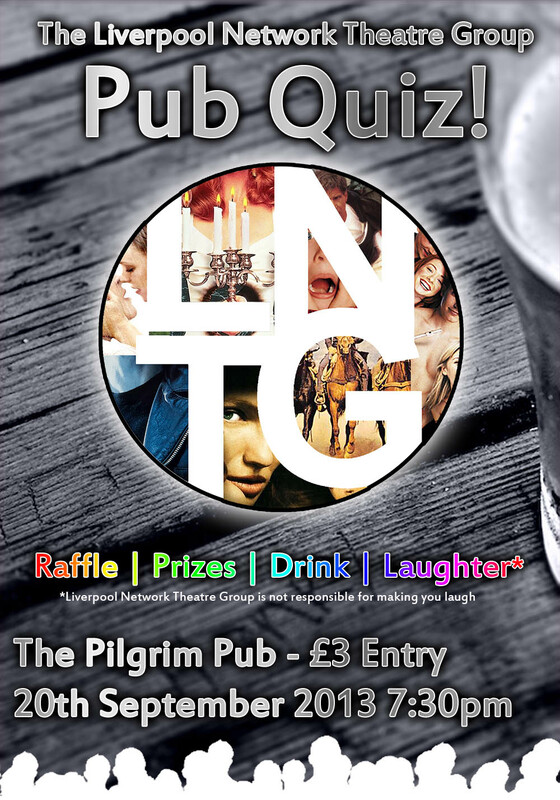 Roll up, roll up, for Liverpool Network Theatre Group’s first ever quiz night! Hosted by our very own Bamber Gascoigne Rob “Two Brains” Griffiths at the Pilgrim Pub (directions below) on 20th September at 7:30pm. It’s a night to discover just how useless your useless knowledge really is and be in with a chance to win fortune and glory (or at least whatever tat we can cobble together for prizes.) All welcome, Networkers and non-Networkers alike. Doors open at 7:30, eyes down at 8pm, £3 entrance. See you there! The Liverpool Network Theatre Group AGM will be held on Tuesday 3rd September at 8pm in our usual workshop venue*. Along with discussing plans for workshops and future productions, we will be electing a new committee. The company is in a period of transition and nominations are being sought for ALL positions on the committee. This is a great opportunity to influence Network’s future direction so don’t be shy! If you are interested in being on the committee (or know someone who is), please get in touch through the “Contact Us” section. You will have to attend the meeting to be able to vote. 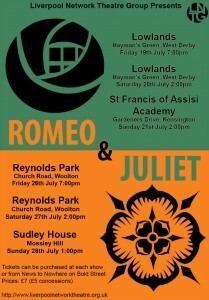 Liverpool Network Theatre Group Proudly Presents ‘Romeo & Juliet’.